[New for early 2017] Mars is not known for releasing a plethora of new ice cream products, but in general there seems to always be at least one new product from them. They already have several tasty ice cream bars that are based on regular candy bars, but they've mixed things up a little this year by basing the next ice cream bar on a candy that doesn't have a bar form. You know I insist on printed wrappers. This wrapper is very eye catching with how busy it is. The only downside (if you can even call it that), is that now I think there are peanut M&M's inside. It's not the biggest bar and I made fairly short work of the first one. 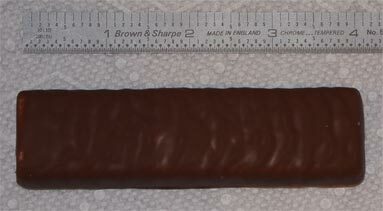 This is a 4-5 bite bar but could easily be noshed in two or three bites. Just 1.63 fl oz per serving. Overall I like it. It's not amazing per say, but it's good. All of the other bars have the benefit of a swirl to add a nice, gooey fun factor that I've always enjoyed. That said, Mars adds a fair amount of mini M&M's which turns into a pretty nice texture for something that's meant to be fun and enjoyable. They needed to keep the spirit of a bag of M&M's and I think they did that here. This was an easy win for Mars. They already have the know how to pump out stuff like this and I'm already envisioning a peanut butter version for next year. 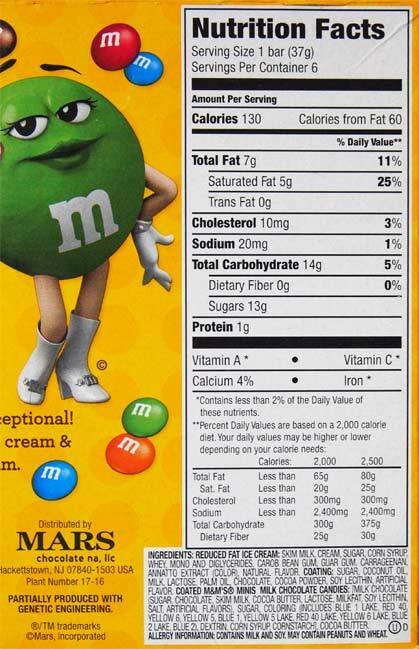 Heck, if the caramel M&M's do well, we could see a caramel based version too, or mint, or who knows what. The possibilities could keep us running for years. On Second Scoop: To put it simply, if you have any urge to try these, I would pick up a box. It's a quick fun treat, plain and simple. My only particular critique is that something is missing. It's not a big thing, just a little thing. I am enjoying these but I feel like it's missing a note whether in the texture or the flavor, but it's missing a little something. Maybe it just needs a few more M&M's to seal the deal. So, if I were you, I would buy a box, devour it with several friends like we would have back in high school, and then see what everyones thoughts are. 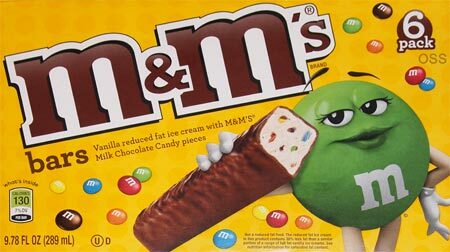 I love vanilla ice cream with m and Ms and it's a favorite to get at shops. I make my own too. But I never see it in packaged ice cream (except that bad breyers one with chocolate and m and Ms). I don't even mind when the candies get a little soggy...Hey, the color streaks in the vanilla are fun! But I don't like ice cream bars at all (I know, I know...Don't like ice cream sandwiches either), so I'm not interested. But I'd love for a company with good vanilla to add the candies...Big ones or the minis. Just 130 calories per bar? You cant beat that! but when all else fails, go local! With the yellow box, I was assuming there would be peanuts in the bar. Is that what could have been missing? What's missing is Crispy or Peanut Butter m&m's mixed into the ice cream instead! Peanut butter flavored ice cream in this would be amazing! That has my vote.